Place 9 muffin liners in a muffin pan. In a double boiler, melt the baking chocolate/chocolate chips and coconut oil, stir well. Fill about 1½ teaspoons of melted chocolate in the muffin liners; tilt them, so the chocolate spreads to the sides. Repeat for all the muffin liners and place the muffin pan into the fridge for a few minutes (until the chocolate hardens). Use about half the chocolate for this step. Roast the peanuts with a pinch of salt in a small pan on medium heat for about 3-4 minutes while stirring occasionally. Chop the peanuts in smaller pieces. Mix the almond butter with the rice syrup and water until it has reached a creamy consistency. Depending on the almond butter you're using, you might have use more or less water to achieve that. 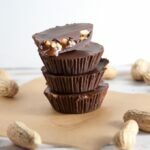 Once the first chocolate layer has set, divide the almond butter mixture into the muffin liners (place it in the middle) and sprinkle the peanuts on top. Use the rest of the melted chocolate to top the cups with. Tilt it a bit so the top is covered with the chocolate completely. Let it harden in the fridge for about 5 minutes. Once the chocolate is hard, carefully remove the cups from the cupcake liners and enjoy! * If you don't have rice syrup at home, you could use agave syrup or maple syrup instead.